View of “No More Reality: Crowd and Performance,” 2009. For the inaugural show of this newly launched two-floor gallery, exhibition curators Claire Staebler and Jelena Vesić present a three-year research project that has taken on various forms (exhibitions, discussions, and publications) on the topics of the crowd versus the individual, public and political space, and demonstration and performance. 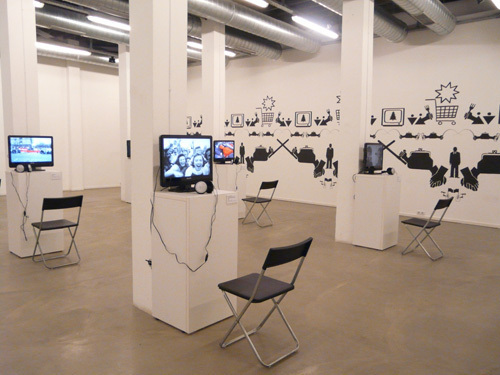 The modest budget and spatial dimensions of the gallery are reflected in the installation: On the ground floor, an appropriately regimental arrangement of monitors hosts video works by artists such as Johanna Billing, The Revolution Will Not Be Televised, Susanne Bürner, and Marcelo Exposito. On opening night, the act of waiting for access to each pair of headphones while standing in an informal line with other visitors accentuated the idea of individual identity within the crowd. Applied to the surrounding walls are REP group’s black vinyl stencils, inspired, perhaps, by Soviet propaganda. This decorative intervention frames the space in a cryptic language of signs the visitor must learn to decipher. A central installation room by Fia Backström dominates the second floor and offers a video and text about group behavior and community. The result of Backström’s structural intervention is that visitors are either inside or outside and therefore on its fringes; there, the regulation of public space is contested by artists such as Cirpian Muresan, in his photographs of graffitied extracts from Elias Canetti’s 1935 novel Auto-da-fé, and Igor Grubić, in his videos and images of dance moves choreographed and performed outdoors to replicate acts of violence. The curators have framed the works in such a way that viewers progress through a thematically relatable physical experience, clearly developed in the various configurations of this project, as they move through the exhibition.